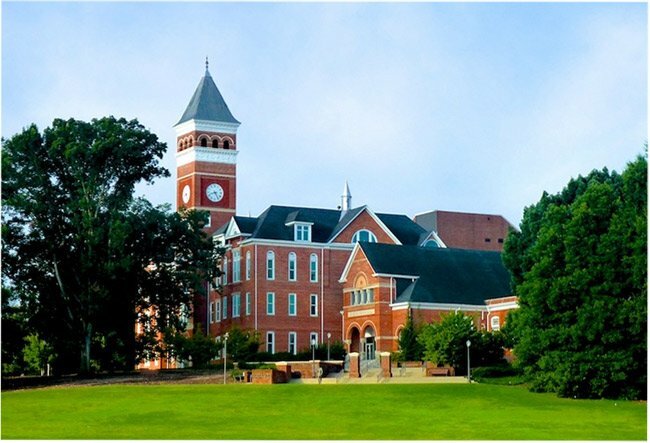 Clemson University was founded in the late 1800s following the death of Thomas Clemson. Born in Philadelphia, Clemson was a champion of agricultural affairs and farming. He moved to South Carolina when he married Anna Calhoun, daughter of South Carolina’s famous statesman, John C. Calhoun. Constructed in 1893 – the same year the college opened – the building itself was renamed in 1946 for Ben Tillman, who oversaw the establishment of the college during his term as governor. 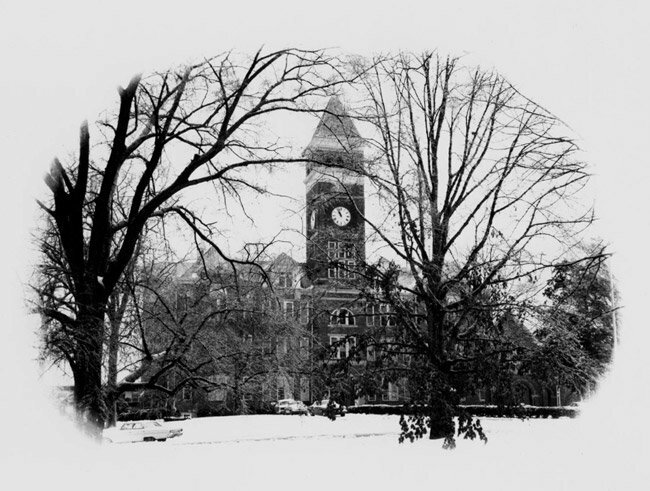 Prior to then the towering structure was known as Main Building; the name was changed to honor Tillman during the fiftieth anniversary of the school’s first graduating class at the behest of Tillman’s son, William. During the mid 1800s Tillman had lobbied for an agricultural school in South Carolina as the leader of the Edgefield Agricultural Society, a political group that promoted itself as reformers. 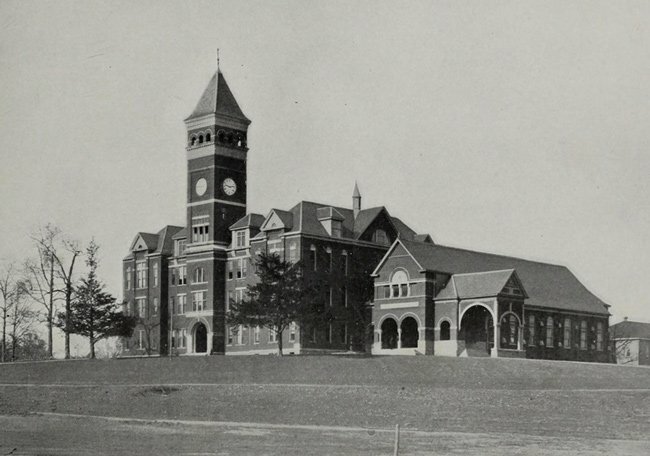 Upon his death, Clemson left the state with an $80,000 endowment for the establishment of an agricultural school, and Tillman pushed for the use of Clemson’s estate for the development of such a college. He and and his fellow members of the “Farmers Movement” saw their dream realized when Governor John Richardson, Jr. signed the Clemson Bill in 1889. 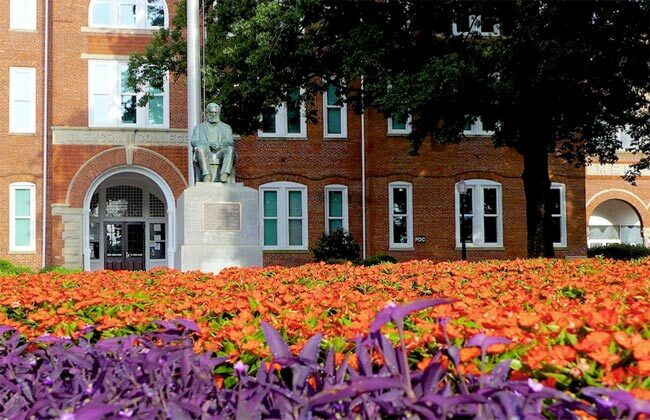 Tillman’s success in establishing Clemson College and his alliance with white farmers propelled him to the office of governor in 1890, though his political journey was wrought with racism and white supremacy. A proud participant in the Hamburg Massacre of 1876 in which one white man and six black men were killed, Tillman often boasted about his involvement with the Red Shirts, a militia group that formed after the federal breakup of the Ku Klux Klan in 1871. The goal of the Red Shirts was to defeat the Republican party in the state, often using tactics such as intimidation, violence, and even murder, despite the fact that “Force Without Violence” was the group’s slogan. Tillman often used his affiliation with the group to bolster his political career. 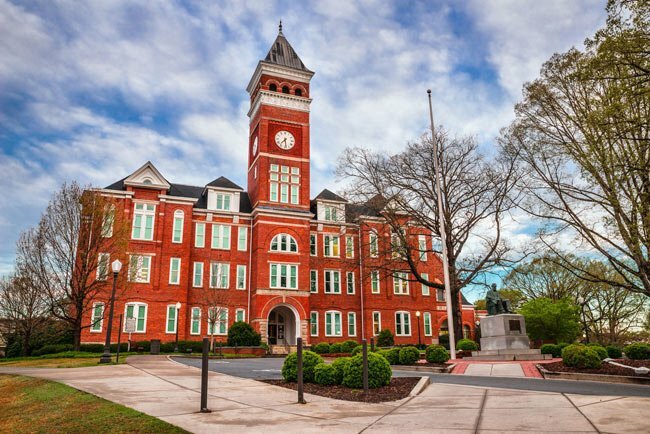 White political superiority became Tillman’s singular goal, which led to his denying federal aid for Clemson because it was tied to accepting a proportionate amount of financial aid for Clafin College, a black college in Orangeburg. Following his final term as governor, Tillman entered the United States Senate in 1895. It was then that Tillman enacted his most sweeping and lasting political effort, calling for the 1895 Constitutional Convention. Though he was no longer in the governor’s office, Tillman pushed for the convention for the primary purpose of eliminating the black vote. The 1895 Constitution that was drafted as a result disenfranchised black South Carolinians by stating that those allowed to vote must own a certain amount of taxable property and demonstrate literacy. Potential voters who failed the literacy test could obtain the vote by proving an acceptable degree of “understanding” of the state constitution. This last rule was deliberately subjective to give latitude to voting officials in granting the vote to illiterate white men while denying the vote to blacks who met the first standard. The constitution also mandated that black and white South Carolinian children attend separate schools. Winthrop University in Rock Hill, another school established under the oversight of Tillman, also has a building on its campus named for the former governor. 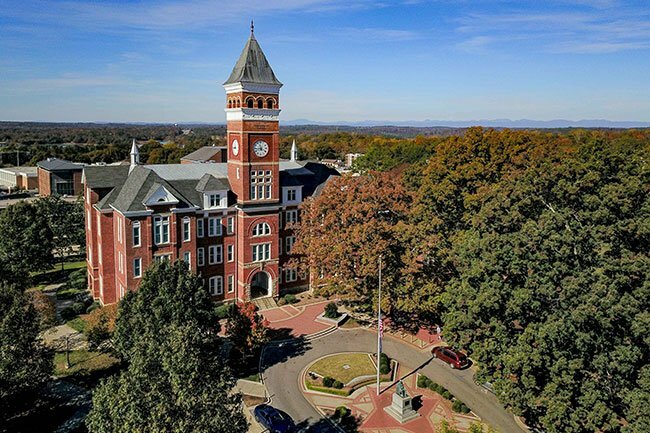 Clemson University Historic District I includes eight historic resources (four academic buildings, a recreational building, a post office, a marching and athletic field, and a park) located on the northern portion of the campus. 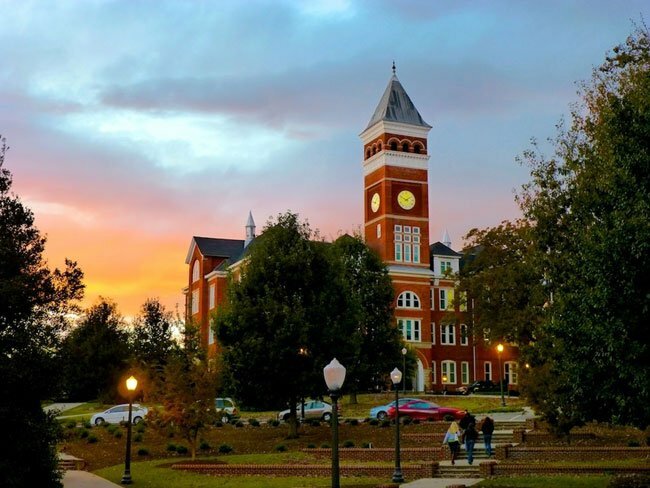 It is significant for its association with the founding, development, and growth of Clemson University, which has played a major role in higher education in South Carolina since its founding in 1889. The district is also significant as an intact collection of late nineteenth and early twentieth century educational buildings at a state-supported land-grant college. Properties in the district include: Tillman Hall (1893), Godfey Hall (1898), Bowman Field (1900), Sikes Hall (1905), Holtendorff Hall (1916), Trustees’ Park (c.1925), Long Hall (1937), and Mell Hall (1939). Styles include Renaissance Revival and Classical Revival. 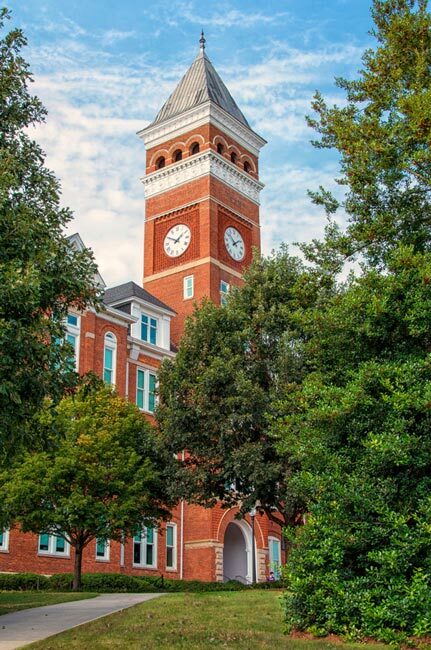 Tillman Hall was designed by architects Bruce and Morgan from Atlanta, Ga. Sikes Hall, Holtzendorff Hall, and Long Hall were designed by Rudolph E. Lee, a Clemson graduate and chair of the Department of Architecture. DuBose, who hails from Seneca, is a Clemson alum and chemistry teacher at nearby Daniel High. Since his wife works at the university, he visits the campus a good bit and says it is one of his favorite places to walk and take photos. Andy and Gary, thanks for the photos and the history behind Tillman Hall. Great job, by two graduates who contribute to the SC Picture Project.